Chocolate chip cookies are a favorite in our house. I am always making them for my resident Cookie Monster (aka Chicken Legs). I had some pistachios in the house and decided to make some Pistachio Chocolate Chip Cookies. I used pistachio pudding in the dough. It made the cookies firm on the outside and soft on the inside - or as I like to say, perfect! Cream the butter and both sugars with an electric mixer, scraping sides of bowl often. Mix in the dry pudding mix. Add the vanilla and eggs; beat until eggs are mixed in. Add the flour mixture to the batter and stir until it is almost fully mixed in. Add oatmeal and continue stirring until flour disappears. Stir in chocolate chips and chopped pistachios. Using a medium cookie scoop (2 Tbsp) drop dough onto parchment lined cookie sheets. Bake for 9-11 minutes or until edges are lightly brown. Transfer to cooling rack and cool completely. 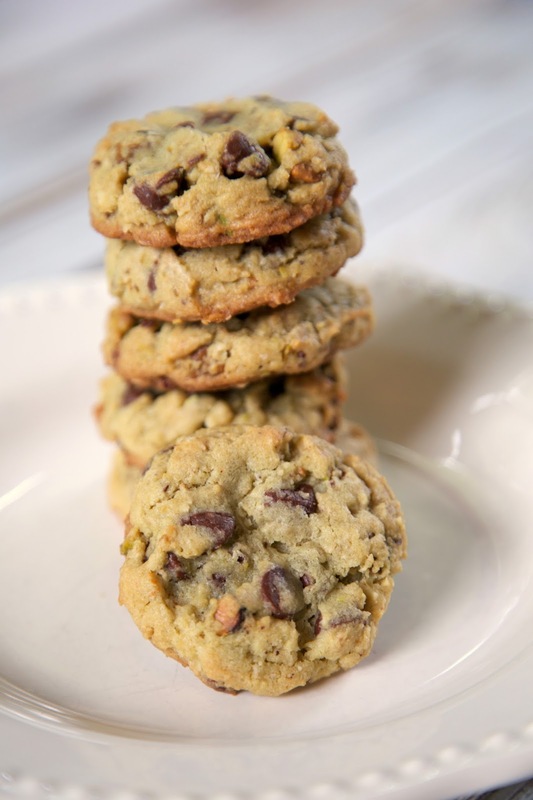 Love pistachios, never thought to put them into a chocolate chip cookie though...genius! Chocolate chip cookies are my favorite! Love that you used pistachio pudding mix in these. Definitely trying soon! Pinning! 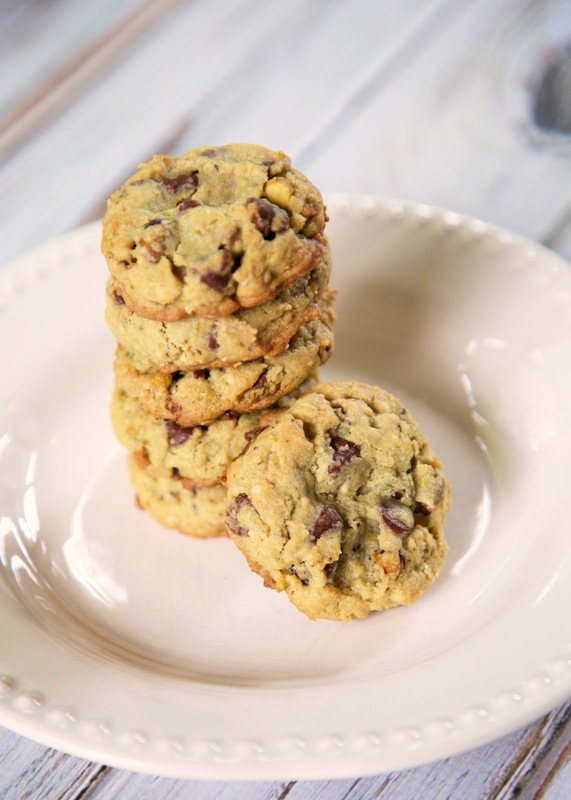 Pistachio + Chocolate Chips are the perfect combo! What's the texture of the cookies? I just found your blog and want to try this cookie recipe. I am an experienced baker but am having trouble with cookie recipes I've tried lately from the internet. It seems my cookies are always flat, real flat! I do not know what I am doing wrong and the only thing I can figure, is a discrepancy in the amount of dry ingredients used. When you measure the flour and granulated sugar, do you use the scoop and sweep method or gently spoon it into the measuring cup and level off? I prefer weighing my ingredients to ensure accuracy. These cookies look sooooo good and I can't wait to make them!! You may try chilling the dough before baking. I like to scoop the dough and put it on the cookie sheet and chill the sheet for about 15 or 20 minutes.